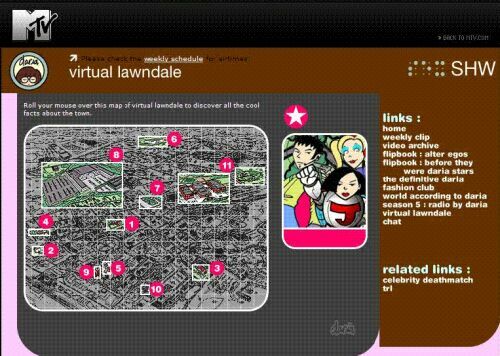 This was a webpage on the now defunct MTV Daria website showing an interactive map of Lawndale, based on the map shown in The Daria Diaries but with significant changes and additions. The page is no longer available as the Daria site on MTV.com has long since been taken down. Among other locations not shown in The Daria Diaries are Kevin Thompson's house, Jake Morgendorffer's office, Helen Morgendorffer's law office, The Pizza Place, and The Zon. This page was last edited on 28 December 2017, at 17:52.